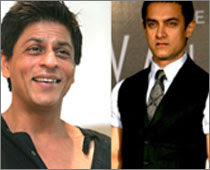 Movie Platz: Who is a bigger brand- SRK or Aamir Khan? The Khan war is again in news, with the two super hit khans, Aamir Khan and Shahrukh Khan trying to prove them better than each other. The cold war between Aamir and Shah Rukh has refreshed with their new releases “Ghajini” and “Rab Ne Bana Di Jodi”. While Shah Rukh is already basking in the success of his movie “Rab Ne Bana Di Jodi”, Aamir expects to do the same with his movie “Ghajini”. The cold war between these two khans has rekindled with Shah Rukh saying "There cannot be any competition with me. I'm the biggest brand in the country. I am always there to endorse for everyone, but the saddest part is that no one is there to endorse for me as there is no brand bigger than me," This statement by Shah Rukh made Aamir state that "He has been speaking about himself for last 20 years so there is nothing new about it." Aamir Khan is right now busy promoting his new film “Ghajini” and when everybody thought that staff at a multiplex sported Aamir’s “Ghajini” look is the movies biggest promotion, Shah Rukh said that there is no bigger brand then himself. We hope that these hit Khans realize that it’s not them but the audience who will prove who out of them is a bigger brand.